Today I'm sharing with you a Magnolia card with one of the old stamps called Cute Sakura Tilda. She was released in 2015 as part of a Sakura collection. Dies used are from la-la land crafts, Magnolia ... Lace is from my stash and flowers from I am roses. Today I'm sharing with you a mini Baby album. For this mini album I used Delivery from Heaven stamp from Magnolia and coloured it with Distress ink pads. I cut out the image using Double Stitched Square Set from Cottage cutz. I used the same die for inside too. On the front I used lots of pretty I am roses flowers, all in my fav pastels. Papers used are from Pion, Easter Greetings collection. Dies used are from Magnolia, Cottage Cutz (squares) and ldrs Creative (button). All layers are machine sewn. I added some lace flowers and some pretty lace from my stash. On the inside I used dies from the latest Magnolia's Sweet Pea Doohickey box vol. 13. So this is the second post for today, my la-la land crafts Friday Inspiration post. :) The theme of our challenge this week is Something for the Girls!!! Super easy, right? For this card I coloured Marci with Books. I used my Distress ink pads. Today I'm sharing with you two cards. First is a Stamping Bella card shared in this post and then in a few hours I'll be sharing my regular Friday Inspiration card for la-la land crafts. For this card I coloured Tiny Townie BONNIE LOVES BOWS from Stamping Bella. I'm entering this card into Stamping Bella Bellarific Friday challenge. The theme of the challenge is Add Glitter. How about a fashion themed card? hehe ... Here's one of the stamps I bought when they came out and never had the time to colour her in. I can't believe it's two years from this release, omg. Her name is Fashion Blog Tilda and she was released in 2015 as part of Magnolia's World Wide Web collection. Papers used are from Maja Design. Dies are from various companies. I'm sure you noticed the cute purses?! Those are a la-la land crafts die. Flowers are from I am roses and all the embellishments are from my stash. For my March challenge design team project I made an Easter card with lots of pretty I am roses flowers. As usual I used a Magnolia image and coloured her with Distress ink pads. Dies used are from various companies: la-la land crafts, Magnolia, Cottage Cutz ... Papers used are from Doodlebug. Welcome to another la-la land club kit post. Today I'm showing you my projects made with February club kit. I made two cards with this kit. On the first card I used Thinking of you Marci. I coloured her using Distress ink pads. 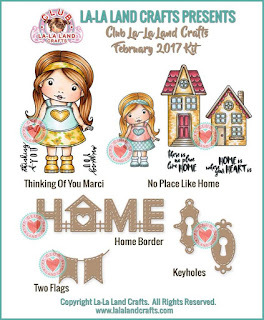 My second club kit project is a Home Welcoming or New Home card. I used No Place Like Home set. I masked houses together and then coloured them with Distress ink pads. 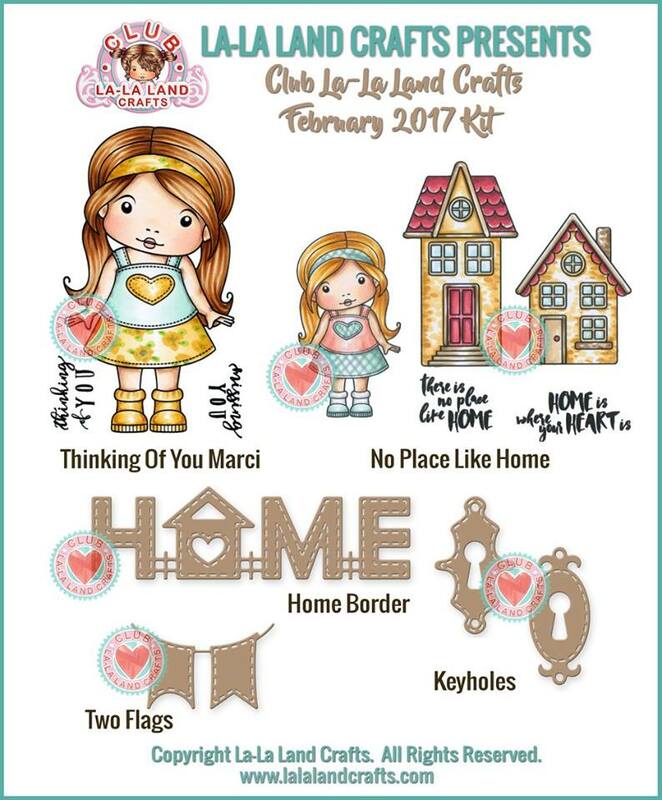 For more February club kit projects, visit la-la land crafts BLOG, FB page, Instagram, Pinterest or Twitter. Image was coloured using Distress ink pads. Shape of the card was cut with Silhouette cameo. Papers used are from Pion Design and Maja Design. I also added a chipboard from Scrapiniec and lots of gorgeous I am roses flowers. Dies used are from Magnolia, LDRS Creative, Cherry Lynn and CC Designs.